A stupa (from the Sanskrit) is a type of Buddhist structure found across the Indian subcontinent, Asia and increasingly in the Western World. Stupas are known in many Southeast Asian countries as chedi (from a Pāli synonym of stupa), and in some countries (particularly Sri Lanka) as dagoba (from Sanskrit dhatu— element, component, or relic + garbha — storehouse or repository). The stupa is the earliest Buddhist religious monument and was originally only a simple mound made up of mud or clay, or a cairn in barren areas, to cover supposed relics of the Buddha. After the ‘passing away’ of the Buddha his remains were cremated and the ashes divided and buried under eight stupas with two further stupas encasing the urn and the embers. Little is known about these early stupas, particularly since it has not been possible to identify the original ten monuments. However, some later stupas, such as at Sarnath and Sanchi, seem to be embellishments of earlier mounds. In the third century BC, after his conversion to Buddhism, the emperor Ashoka had the original stupas opened and the remains distributed among the several thousand stupas he had built. Nevertheless, the stupas at the eight places associated with the life of the Buddha continued to be of particular importance. Accordingly, the importance of a stupa changed from being a funerary monument to being an object of veneration. As a consequence their appearance changed also. They evolved into large hemispherical mounds with features such as the torana (gateway), the vedica (fence like enclosure evolved from the vedic villages), the harmika (a square platform with railings on top of the stupa), chattrayashti (the parasol or canopy) and a circumambulatory around the stupa. 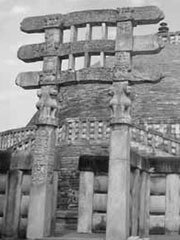 From the first century BCE onwards, stupas were incorporated into the hall of the chaitya-griha. The oldest existing stupa is at Sanchi, India, while the tallest is the Phra Pathom Chedi in Nakhon Pathom, Thailand, with a height of 127 metres. The stupa evolved into the pagoda as Buddhism spread to other Asian countries. The pagoda has varied forms that also include bellshaped and pyramidal ones. Today, in the Western context, there is no clear distinction between the stupa and the pagoda. But in general stupa is used for a Buddhist structure of India or south-east Asia, while pagoda refers to a building in east Asia which can be entered and which may be secular in purpose. Each of these components is rich in metaphoric content and is identified with one of the five cosmic elements said to make up the entire manifested existence. These are earth, water, fire, air and space.